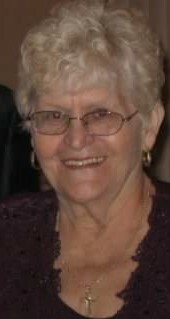 Mary Ann “Mania” (Rychlik) Anuszek, 88, of East Vandergrift, passed away Wednesday, January 23, 2019 surrounded by her loving family at Allegheny General Hospital in Pittsburgh. She was born Friday, January 16, 1931 in Natrona, PA, the daughter of the late Joseph and Mary (Rutkowski) Rychlik. Mary, affectionately known as Babci to her family and Mania (pronounced mun-ya) to everyone else, was very proud of her Polish heritage. She liked good conversation, going to casinos and on beach vacations, playing the lottery, and most of all being with her family. She was the life of the party and an entertainer at heart, who specialized in cooking a wealth of Polish food. Mania was the first female mayor of East Vandergrift, a Democratic Committee Woman, and member of Our Lady Queen of Peace. Before her retirement, she was employed by Kiski Area School District in the cafeteria. She is survived by three daughters: Charlene Butch and her husband Peter of Apollo, Marla Wawrzyniak and her husband Paul of East Vandergrift, and Lisa Taraszewski and her husband Quentin of Oklahoma Borough; eight grandchildren: Michelle Tometsko and her husband Mike of Export, Michael Buccicone and his wife Mindy of Export, Maria Butch (Paul) of Murrysville, Melanie Keim and her husband Adam of PA Furnace, Kelly Flemm and her husband Mark of Allegheny Township, Nicole Kamer of East Vandergrift, Melissa Phillips and her husband Mark of Delmont, and Quentin Taraszewski and his wife Dominique of Allegheny Township; 13 great grandchildren; her loving companion Roland Cochran; and numerous nieces and nephews. In addition to her parents, she was preceded in death by her husband, Edward A. Anuszek; a daughter, Michaelene Anuszek; a grandson, Justin Kamer; four sisters, Elizabeth Turowski, Nellie Szymanski, Regina Glath and Laura Pawlik; and two brothers, Leonard and Edward Rychlik.